TungLok Seafood — a concept by the reputable TungLok Group — has made quite a name for itself amongst Singaporeans with its exceptionally fresh Singapore-style seafood delicacies. 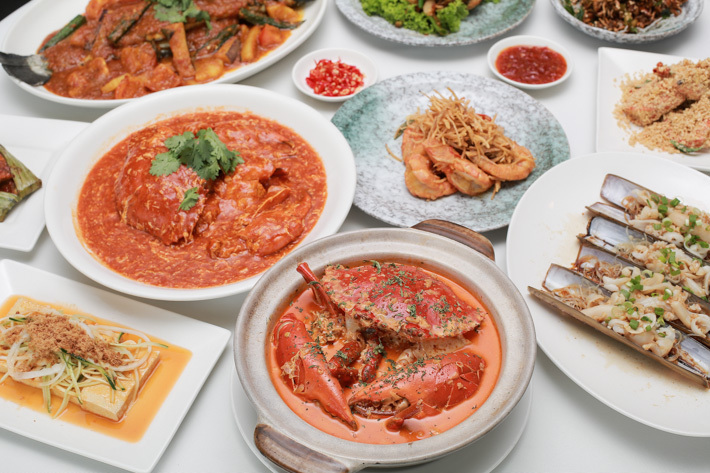 Known for their commendable service and quality seafood, expect nothing short of a stellar dining experience at this award-winning establishment; choose to dine at either the restaurant at Orchard Central or the outlet at Arena Country Club in Jurong. Everyone who has been to TungLok Seafood only has good things to say about the place, and rightfully so. Their extensive menu only means that you will be spoilt for choice. Look forward to hot favourites such as Laksa Crab Bee Hoon, Salted Egg Yolk Prawns, Mee Goreng and Crisp-fried Baby Squid. Readers of ladyironchef can flash this article to get 15% off (no minimum spending) a la carte food orders at TungLok Seafood. Here are 12 Singapore-style Seafood Dishes from TungLok Seafood that we thoroughly enjoyed. The Crispy-fried Baby Squids (S$12++/small) definitely whets your appetite for more, and it was an appetiser that left all of us in awe. These baby squids have been deep-fried till crisp, but sink your teeth into them and you would realise that every piece has retained its chewiness within. Covered in sweet sauce and a handful of sesame seeds, these crispy baby squids are pretty damn addictive. 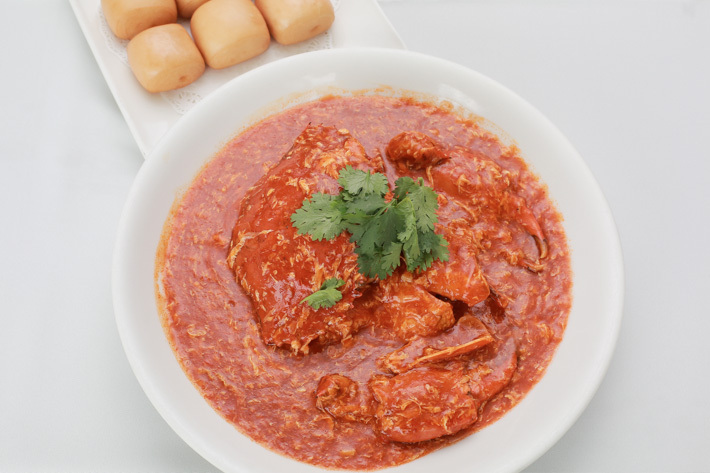 Chilli crab is not just a hit among the locals, it has also become one of Singapore’s most iconic dishes. 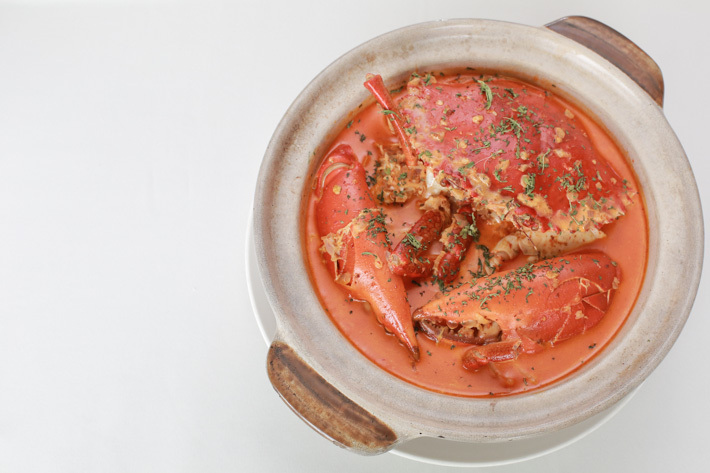 TungLok Seafood’s Chilli Crab (S$65++/kg) is one of the restaurant’s bestsellers and why are we not surprised. The crabs are cooked to perfection and its plump flesh does not stick to the shell; the outer shell breaks easily hence allowing one to dig into the fresh crabmeat almost effortlessly. The secret ingredient that lies in the chilli-based tomato sauce is one that gives the viscous gravy an extra oomph, and you would never have guessed that it is freshly squeezed orange juice. Try it and witness the difference. You will be convinced why TungLok Seafood has one of the best chilli crabs in Singapore. This new dish is reason enough for you to visit TungLok Seafood. 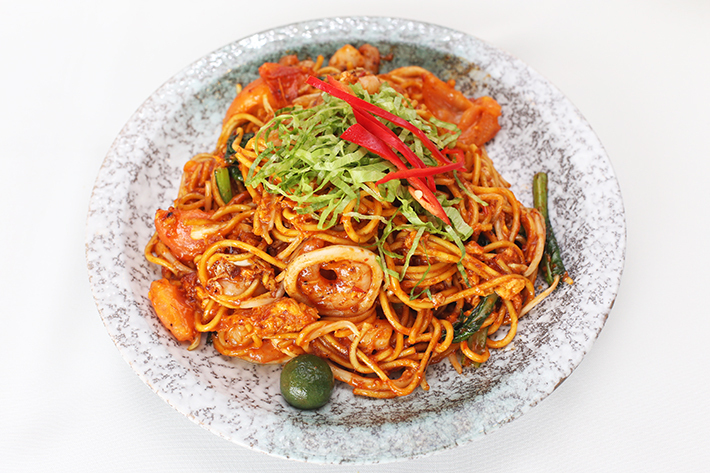 We all love our XO Crab Bee Hoon, but what if we told you there is a Laksa version? Tunglok Seafood’s Spicy Curry Laksa Crab with Thick Rice Vermicelli (S$65++/kg) serves just the same purpose of bringing comfort to the soul. This massive pot features premium Sri Lankan crab immersed in an aromatic spicy curry broth. The dish is complemented with a generous portion of chewy thick rice vermicelli. A pot is typically good for 2-3 diners. The aroma of TungLok Seafood’s Deep-fried Prawns with Crispy Oats permeated the restaurant when it was presented to us. 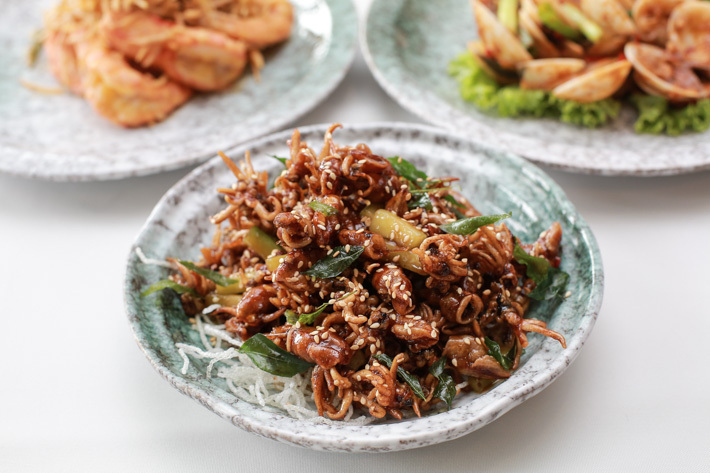 Huge prawns are deep-fried with oats to crispy, crunchy excellence; this dish perfectly marries sweet with savoury. It comes in a single serving size starting from S$24++ per 300 grams, but that is enough to feed two. Once again, you will be treated to plenty of prawns stacked on top of a bed of fragrant golden oats. What is a seafood meal without some salted egg yolk prawns, right? We have all grown too accustomed to ordering salted egg yolk-something, and when in a seafood restaurant — TungLok Seafood in particular — the Deep-fried Prawns with Salted Egg Yolk (S$24++/300gm) is the ultimate crowd pleaser. 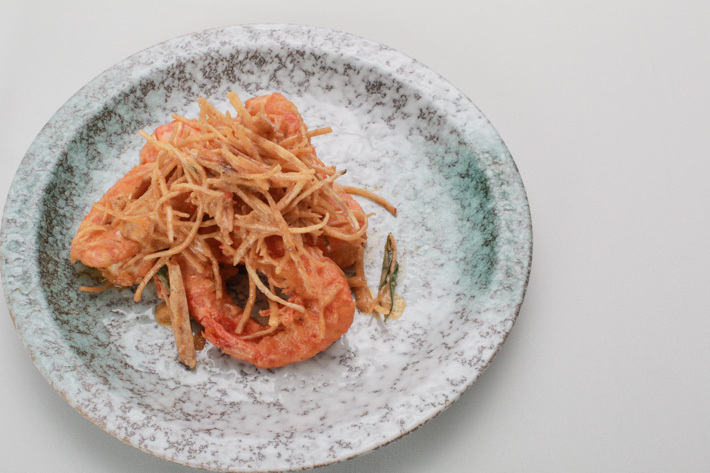 The prawns are deep-fried, leaving it with crispy shells that give way to juicy and succulent prawn meat. See those strips on top of the prawns? Those are salted egg yolk strips that were so irresistibly yummy, like we were munching on chips. 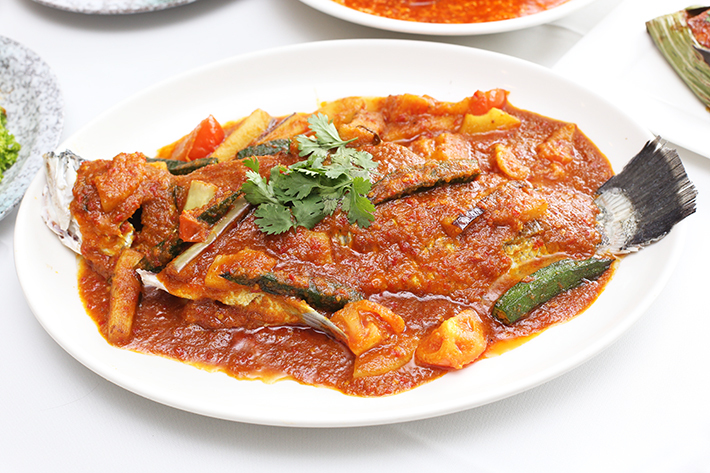 Singapore seafood dishes go hand-in-hand with sambal sauce. These Sautéed Clams with Sambal Sauce (S$18++/small) are no different. 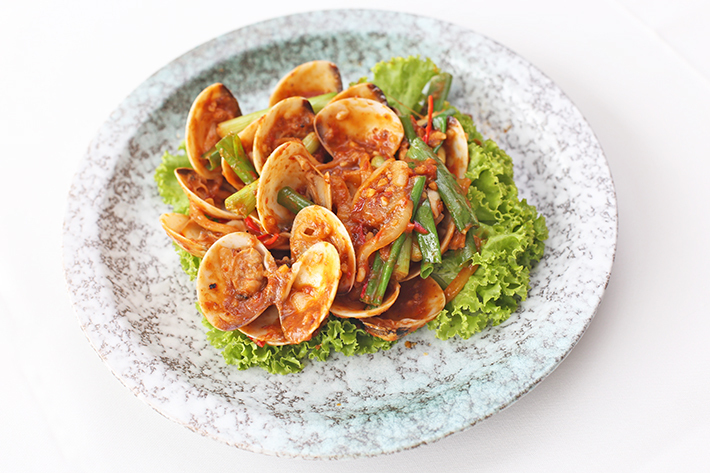 A hefty portion of clams is stacked high on the plate, all drenched in sambal sauce that has an irresistible spicy tanginess. The molluscan is fried over high heat quickly to achieve a tenderness and served atop a bed of green lettuce; briny, fresh and spicy. 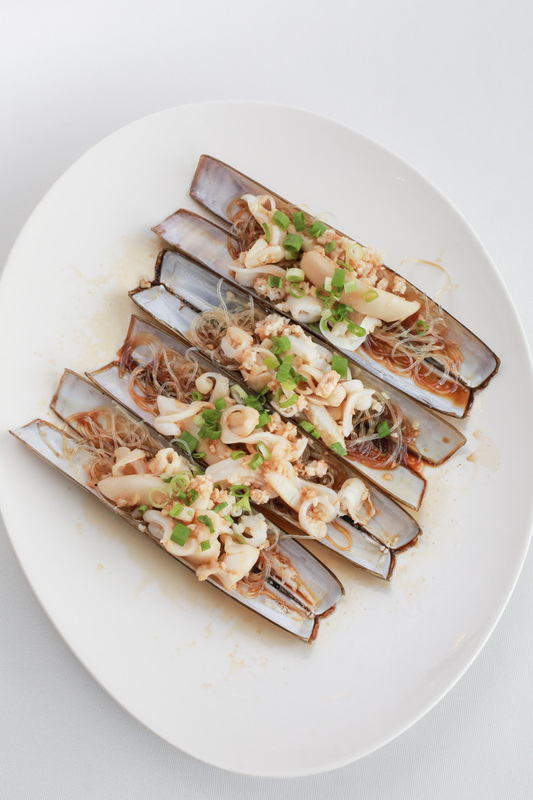 Steamed Razor Clam with Garlic and Vermicelli is a well-loved Hong Kong-style dish that is commonly seen in Chinese restaurants, and TungLok Seafood has hit all the right spots with their rendition. Priced at S$10++ per piece, the steaming process brought out the sweetness of the succulent meat, and the chopped garlic enhanced the fragrance further. This is such a classic dish and it has become one of our must-orders when at TungLok Seafood. No, that’s not a grilled fish otah. We were initially deceived by the misleading banana leaf wrapper, but soon realised that within the fragrant parcel is actually a high-quality baked salmon (S$12.80++/pc). 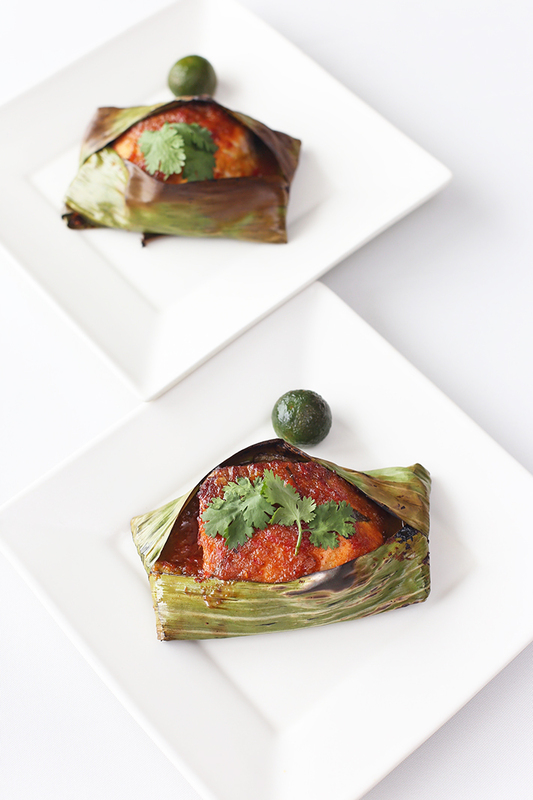 The fresh Norwegian salmon is baked with a hint of fragrance borrowed from the banana leaf. This east-meets-west seafood dish far exceeds expectations, and its uniqueness is one that will leave your jaw dropping upon the first bite. The rich Assam sauce in this one beckons like no other. If you like tangy flavours, this one is definitely a must. Together with the sweetness of fresh fish, the Steamed Seabass with Assam Sauce, Tomatoes and Eggplant (S$45++/kg) is a clear winner. 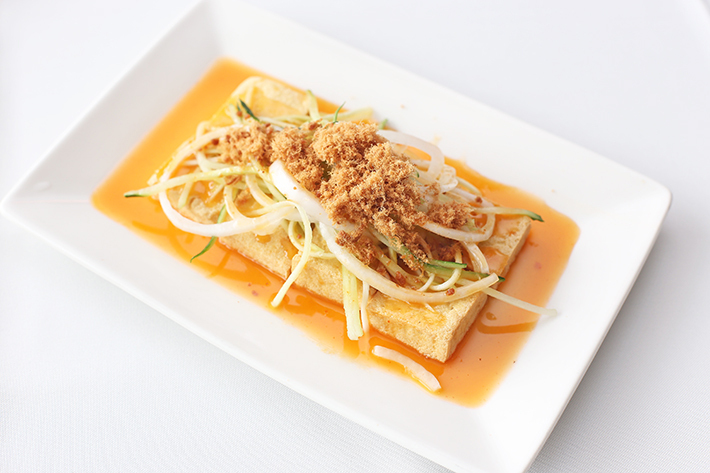 These Thai-style Braised Beancurd features firm tofu cuboids topped with julienned cucumber and chicken/pork floss. The soft white blocks – encased by its fried golden skin – are accompanied by sweet Thai chilli sauce. 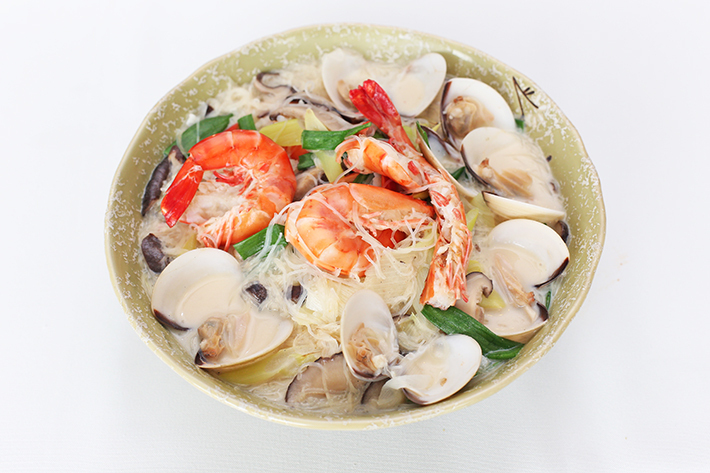 The Braised Rice Noodle with Prawns and Clams (S$24++/small) is another carbs dish that is great for sharing. It comprises fresh clams, juicy prawns, mushrooms and mixed vegetables, and is especially comforting on a cold rainy day! TungLok Seafood’s interpretation of the Chinese-style Mee Goreng (S$18++/small) is hands down one of the best we’ve ever tried in Singapore and we cannot stop raving about it! These noodles – stir-fried with shrimps and calamari rings – boast a distinctive complex taste profile of sweetness, spiciness and tanginess. Let’s just say we will return to TungLok Seafood just for this dish. No joke about that. Readers of ladyironchef can flash this article to enjoy 15% off a la carte food orders at TungLok Seafood (no minimum spending). This promotion is valid from now until 30 November 2016 and not valid on eves of and on Public Holidays and special occasions. This post is brought to you by TungLok Seafood.